A light haze instead of clear lines. Alluring uncertainty, thrilling, intriguing...all of this is captured by smoky eyes, a makeup technique that has won great popularity. Do you want to be a femme fatale, a mysterious stranger, or perhaps a drama queen? Then the smoky eyes makeup technique is especially designed for you. This makeup look appeared in the beginning of the last century, but it has not lost its relevance. For many, this is their most favorite makeup look. As it’s understood from its name, smoky eyes are characterized by a certain vagueness, a smooth transition from one shade to another. You should pick multiple shades of color to combine with each other for this look. The classic choice is light beige, gray, and black. But there are other color combinations which are selected based on eye color. 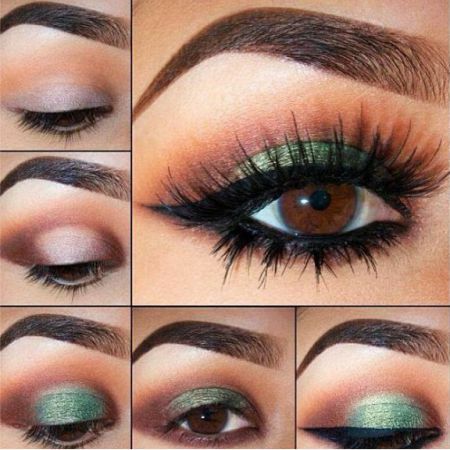 Thus, chocolate shades are suitable for green eyes, and olive green or purple go best with brown eyes. You can use blue shades for smoky eyes, but use it with caution because it can create the effect of bruises around the eyes if applied incorrectly. The smoky eyes makeup technique includes several steps. First, use a black eye pencil to draw wings and carefully fill them in. The second step is to apply the lightest shade of eyeshadow on your eyelid and up to the eyebrows. The area directly underneath the eyebrows needs lightening. Afterwards, highlight the arc in your eye cavity by applying a darker shade to the outer corner of the eye and moving inward. On the lower eyelid, the eyeshadows are applied from the outer corner moving inward as well, with a gradual decrease in the intensity of the eyeshadow. Whatever you do, be sure to carefully blend all of the eyeshadow colors. For this look, I recommend not using liquid liner as it clearly underscores the shape of the eye. What is the technique of makeup Smokey Eyes? To finish off your look, fill in your eyebrows and add a little blush to your cheekbones. This makeup style really brings out the eyes, so don’t go too bold with your choice in lip color. Try sticking to neutral lip shades so as to not take the focus away from the eyes. The smoky eyes makeup technique can be used in everyday life and on special occasions. The only difference is that for evenings out, you should choose darker and more saturated colors. If it’s done correctly, your look will gain a particular depth, expressiveness, and flair! Like the article «The Smoky Eyes Makeup Technique»? Share it with friends!